Click on the icon in the top left of the map to see a list of locations. 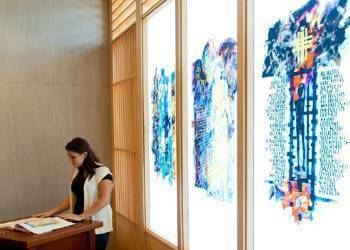 Discover our chapels, artwork, and sacred spaces on campus. 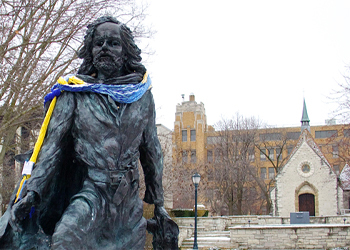 Take a pilgrimage of the religious spaces on campus, and see how the Marquette community lives its Jesuit and Catholic identity every day. President Michael Lovell leads a tour of a few of the sacred spaces. Note: Not all artwork is displayed at all times. 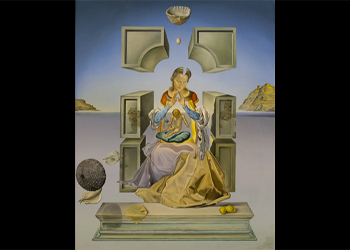 The Madonna of Port Lligat is the name of two paintings by Salvador Dalí. The first was created in 1949 and is housed in the Haggerty Museum of Art at Marquette. In Miserere, Georges Rouault makes recurring use of sacramental symbols and devotional imagery originating in the Middle Ages. 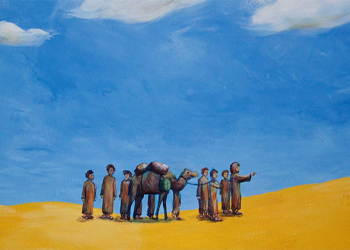 The Saint John's Bible includes 160 illuminations, reflecting a contemporary approach to biblical interpretation and incorporating imagery from both Eastern and Western religious traditions. 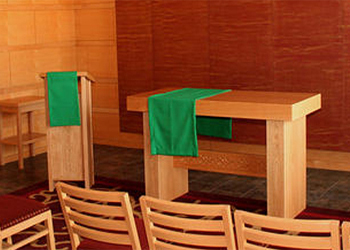 Located in the Alumni Memorial Union, the Chapel of the Holy Family is one chapel made up of several components. Church of the Gesu is a Gothic-style church that was completed and dedicated on December 16, 1894. 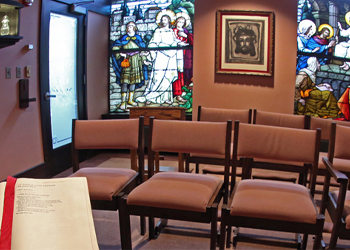 This chapel is open and accessible to Cobeen Hall residents whenever the hall is open. 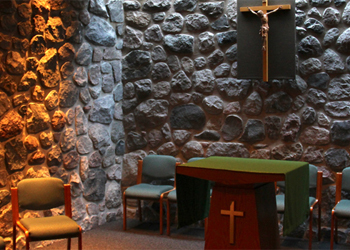 This chapel is open to the Jesuits residing or staying at the Dr. E. J. O’Brien Jesuit Residence. 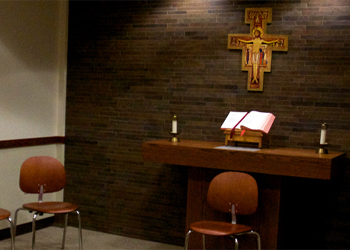 The Eucharistic Chapel is located in the Alumni Memorial Union as part of the Chapel of the Holy Family. 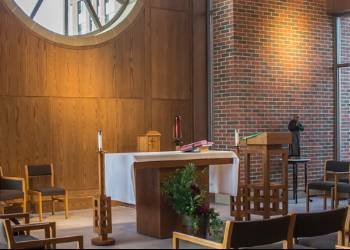 The Madonna Della Strada Chapel, named in honor of the first Jesuit church in Rome, offers Marquette community members a quiet, intimate space inside Zilber Hall. 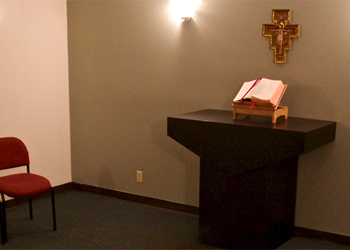 This chapel is open and accessible to Mashuda Hall residents whenever the hall is open. 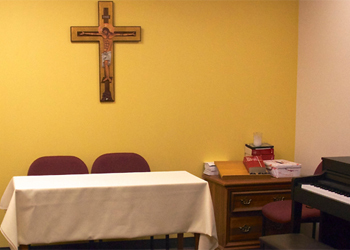 The Chapel of St. Edmund Campion is open to the Law School and Marquette community whenever Eckstein Hall is open. 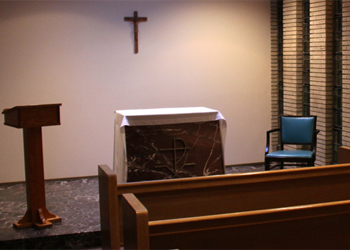 This chapel is open and accessible to Straz Tower Hall residents whenever the hall is open. St. Joan of Arc Chapel was constructed late in the 14th or early in the 15th century in southeastern France, near the city of Lyon. 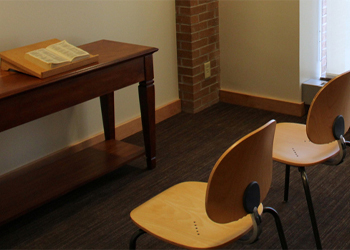 This chapel is open and accessible to Schroeder Hall residents whenever the hall is open. 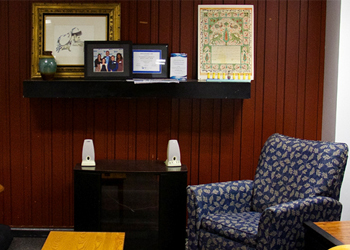 The Center for Jewish Life at Marquette serves as a program and meeting space for Jewish and non-Jewish students looking to learn more about the Jewish religion and culture. 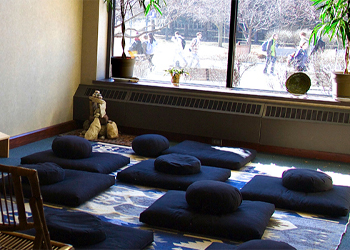 Located in the Alumni Memorial Union, room 233, the Interfaith Meditation and Prayer Space is open daily for individual prayer and meditation. 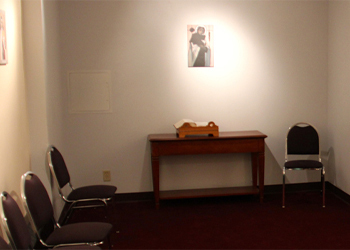 Located in the Alumni Memorial Union, room 231, the Islamic Prayer Room offers opportunities for individual prayer throughout the day. 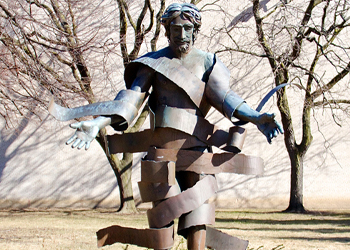 Located west of the Varsity Theatre, just north of Wisconsin Avenue, Christ Arisen features Christ with his arms down and extended in an open, loving gesture. 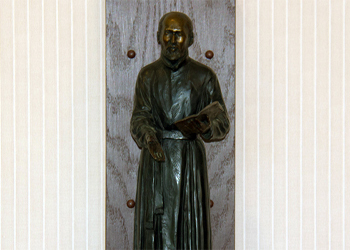 This bronze statue honors the 17th-century French, Jesuit missionary and explorer for whom Marquette University is named. 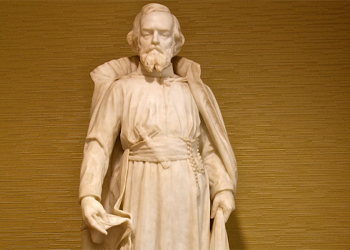 This marble statue of Father Marquette is a replica of the statue representing Wisconsin in the National Statuary Hall Collection in the U.S. Capitol. This statue of Mother Teresa holding a child was dedicated in 2009 and is located just west of St. Joan of Arc Chapel in the heart of campus.